Peggy Boykin, age 91 of Albany, passed away Friday, March 22, 2019. Funeral services will be held at 2pm, Tuesday, March 26th at Liberty Baptist Church in Hawkins, Texas with Rev. David Franklin officiating. Interment will follow at the Liberty Cemetery under the direction of Morehart Mortuary. 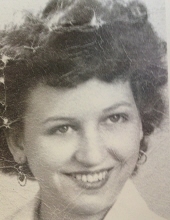 Peggy Joyce Tucker was born March 13, 1928 in Albany, Texas to Frank L. Tucker and Viola Loader Tucker. She graduated from Albany High School and went on to graduated from beauty school in Abilene. She married Elmer C. Boykin on March 12, 1947. Mrs. Boykin was a beautician and also owned and operated The Fish Hawk on Lake Hawkins with Mr. Boykin. The Boykin lived in Grand Prairie, Arlington and Hawkins. Mrs. Boykin moves back to Albany after Mr. Boykin passed away and lived in Albany for the last 20 years. She was a member of First Baptist Church in Albany and a former member of Liberty Baptist in Hawkins. Mrs. Boykin was a docent at the Old Jail Art Center, a member of the Albany Study Club and the Eastern Star. She enjoyed quilting, sewing, crocheting, and shopping. She was preceded in death by her husband; parents; one sister, Josephine Wheeler. Mrs. Boykin is survived by her three children, Jimmy C. Boykin of Houston, Gregory W. Boykin & wife Levida of Palestine, Patricia Marlow & husband Charles of Albany; five grandchildren, John D. Boykin, Tori Boykin, Justin Boykin & wife Brittany, Joshua Terry & wife Jenn, Joseph Terry & wife Brittany; seven great grandchildren; one brother, Frank Tucker; one sister, Glenna Green. Memorials may be made to the American Diabetes Association, PO Box 11454, Alexandria, VA, 22312. Condolences may be made online at www.morehartmortuary.net. "Email Address" would like to share the life celebration of Peggy Boykin. Click on the "link" to go to share a favorite memory or leave a condolence message for the family.